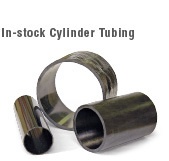 Black Amalgon® / The lightweight, corrosion-resistant alternative to steel, aluminum or brass cylinders. The lightweight, corrosion-resistant alternative to steel, aluminum or brass cylinders. Constructed of fiber-reinforced thermoset epoxy matrix, Black Amalgon features an ultra-smooth inner surface. It is a lightweight, high-strength, corrosion-resistant composite alternative to carbon steel, honed and chromed steel, stainless steel and aluminum or brass cylinder barrels. One-fourth the weight of steel and 25 percent lighter than aluminum, Black Amalgon reduces material handling and shipping costs, speeds up assembly times and decreases stress loads on connected components. Our manufacturing process ensures a smooth, self-lubricating interior surface that prevents pistons from sticking even when idled for months. 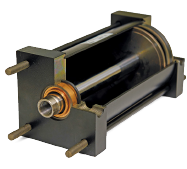 Seals can withstand more than one million strokes before replacement in our non-lubricated cylinders. Black Amalgon retains its circular shape and doesn’t dent like metals. Its material impact strength is 40 lzod ft-lbs. 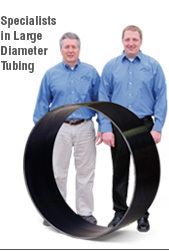 Built for maximum internal pressure under a compressive load.